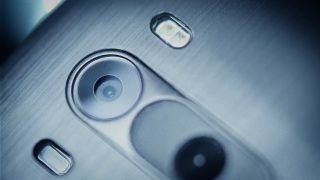 The LG G Note cometh? MWC is when many of the year's biggest announcements take place, but it's also a great time for big companies to drop a hint or two of things to come. At MWC 2015 this year, LG did just that, teasing a new flagship that may turn out to be a line of high-end phablets starting with the LG G4 Note. That's what sources told the Korea Herald, and it turns out LG applied for a related trademark with Korea's patent office in February. LG President and COO Cho Ju-no said during MWC that the company will reveal the LG G4 during the second quarter of this year, and a new flagship later in 2015. The new phone is expected to be higher-end than the current G line, but other than that there are few clues as to what it will look like. Considering we won't see it before the LG G4 - which could still be weeks away - we'll file this one away for a future date.